Fine paintings by Claude Venard in the context of fellow European post-cubists Youla Chapoval, Marcel Burtin, Jacques Lagrange and Reynold Arnould. Claude Venard (1913-1999) was a central figure of the post-war School of Paris and became internationally renowned during the 1950's for his bold heavily impastoed Post-Cubist paintings, built up through layer upon layer of pigment incorporating different resins and varnishes to an almost sculptural level. To experience Venard's work is a rich visceral sensation. In his twenties Venard had fled from the orthodoxy of the Académie des Beaux-Arts in Paris after only 48 hours. 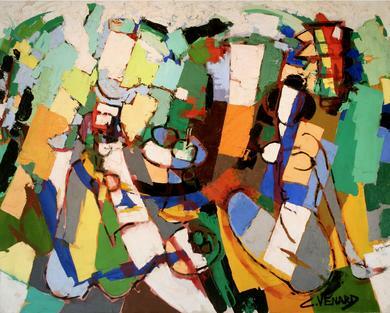 In 1938 he signed the avant-garde “Rupture” manifesto, and participated in the "Forces Nouvelles" group exhibitions. After the war (during which he enlisted and fought before ending up in a prison camp and subsequently escaping), he rejected the "miserablisme" of many of his fellow artists, and developed his own vibrant expressive technique which received great acclaim, and for which he is now famous. Alongside Venard, this exhibition brings together other artists from the period whose work also explored the possibilities opened up by the Cubists’ deconstruction of the single viewpoint perspective which had been convention in Western art since the Renaissance. In contrast to Venard, the Russian émigré Youla Chapoval’s compositions liberated from the formulaic strictures of analytical Cubism, are serene and harmonious; Marcel Burtin flattens the space altogether resulting in semi-abstract familiar shapes; Jacques Lagrange’s typically vibrant work is inspired by the geometry of the rooftops beneath the viaduct of Arcueil; and Reynold Arnould’s “dynamist” work combines Cubist techniques with elements of Futurism to dazzling effect.